Email to me this morning from USGS. Last Saturday I wrote of 2018 being an extremely busy volatile year for major quakes and volcano activity up to April 10th when it all suddenly stopped which is highly unusual. 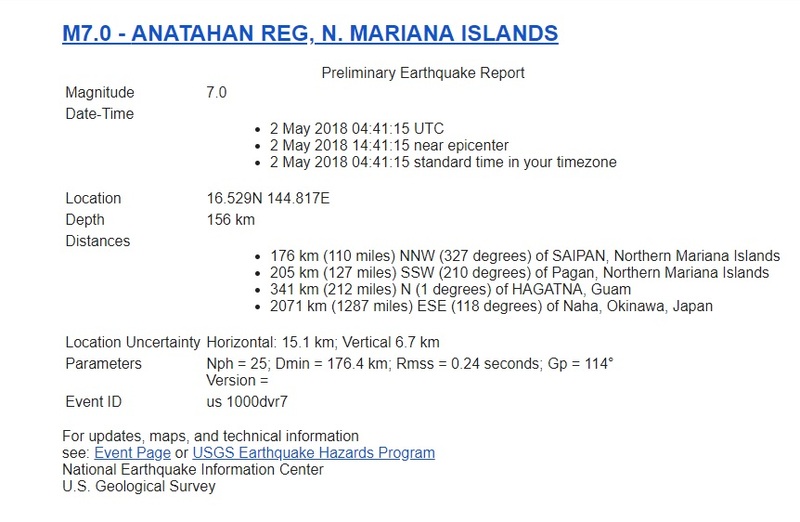 Imagine my excitement this morning (yes I find major quakes exciting) when an email arrived on my tray from USGS claiming a Magnitude 7.0 - on "ANATAHAN REG, N. MARIANA ISLANDS" had struck during the night. I clicked on the link with the email which took me directly to USGS only to find no mention of a magnitude 7.0 quake anywhere on the planet and the largest quake of the day on the Mariana Island was a magnitude 4.6. A couple of problems here, surely USGS with all their wonderful technology could not in anyway make such an enormous mistake, the enormity of the strength between a mag 7. and mag 4.6 is huge especially with the sensitivity of USGS quake monitoring equipment. Secondly, how can USGS send out emails to people claiming a major quake has occurred in an area when it hasn't? Can you imagine the panic with people receiving this email who have family living on the islands? This is not the first time I have received emails from USGS alerting me of a major quake only to find no sign of it on the USGS site, strange indeed.